Avoiding cold sores is now possible! Cold sores (herpetic lesions) are groups of small blisters around the mouth or on the lips that are caused by the herpes simplex virus. A break in the skin inside or around the mouth, gives the virus an entrance point into the body. Contact with infected body fluid allows the virus to spread. This can occur when sharing things like eating utensils or cups, razors or lip balm, or kissing or touching that person’s saliva. A well-meaning kiss from a parent to child is a common way that this virus spreads. 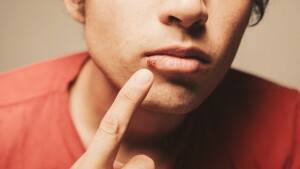 Cold sores will begin to heal on their own a few days after they appear and will usually go away within a week or two. Despite this, cold sores are often very painful, and treatment for that is available. Pills and ointments are commonly prescribed to lessen the uncomfortable symptoms, and will help the sore to heal a day or two faster. Today, dental soft tissue lasers are available and are a much more effective treatment. Laser treatment for cold sores is best done at the very onset of symptoms and can prevent the sore from occurring. As soon as any of these symptoms present, call our office to schedule an appointment. Even if the sore is already there, laser treatment can provide relief from the discomfort of the sore and allow it to heal much faster. The virus that causes cold sores cannot be cured. Once you have been infected, the virus will lie dormant in your body for the rest of your life and will resurface from time to time. Laser treatment can reduce the number and severity of future sores. Multiple laser treatments may stop the sores from recurring in a particular spot. Best of all: laser treatment of cold sores is affordable, relief is immediate, and treatment can even prevent sores if done early enough. The treatment takes only a few minutes and can be done without anesthesia. After treatment sores are less frequent and less severe.